A few years ago Nathan moved temporarily from Ontario to small town Alberton, Prince Edward Island to help his Mother set up her new restaurant in town - The Sidewalk Grill. Around the same time, Naomi also moved to Alberton when she got a pharmacist job after graduation. Neither intended to stay in the small town long term, but everything changed when they crossed paths and met each other. With their workplaces being close by, Naomi would often head to the restaurant for lunch and strike up conversations with Nate. Their lunch time interactions soon changed to dates, and the two quickly fell in love. Fittingly, Nate proposed to Naomi over breakfast one morning! Fast forward to now, Naomi & Nate have bought a beautiful home together and have settled in the small town where they met! 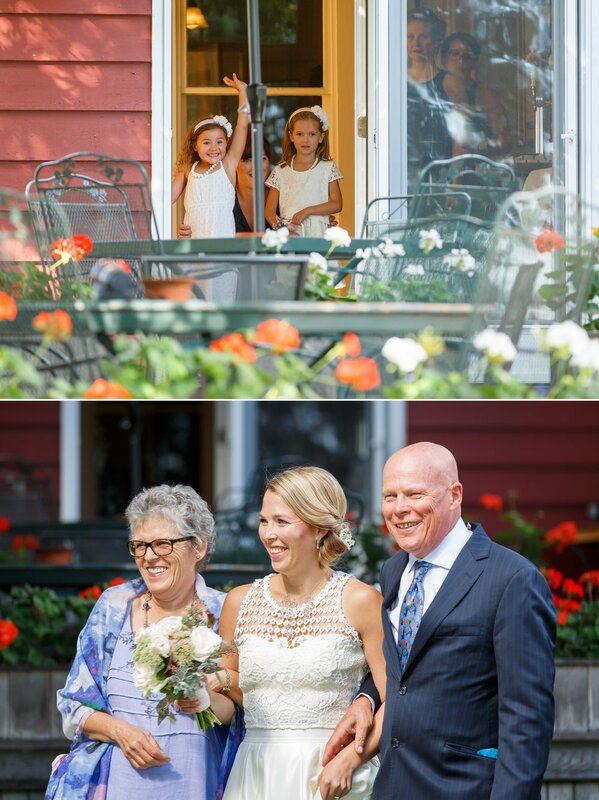 Naomi grew up as a fisherman's daughter in Souris, PEI so their wedding reception took place on the pier at Northport Harbour. Their decor tied in nautical with the Fall colors, blue and white being highlights. Their favorite moment of the day was seeing each other as Naomi walked down the isle, all their nerves changing to joy and excitement. Naomi & Nathan are two of the kindest people you can ever meet, and they are a pleasure to be around. All day you could feel how special it was for both of them to have everyone together, and see the love from around the room. 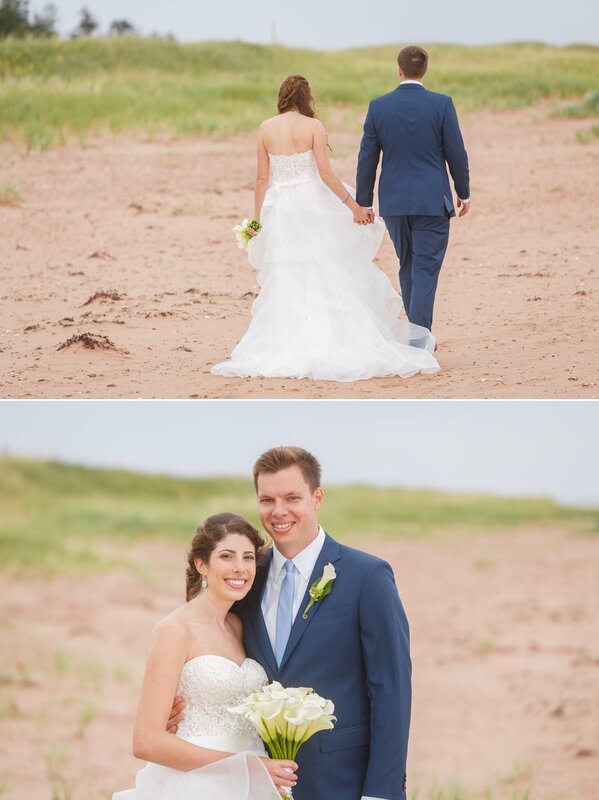 We photographed on the cliffs in Western PEI, in their backyard, and at Northport pier. I'm so happy I was able to capture their wedding, and just spend a day with them too! Congratulations Naomi & Nate! Amy & Web grew up in the same town in Massachusetts and went to high school together. They connected early because of how much they laughed together, and remained friends over the years and through college. After graduation they both ended up moving to Boston where they reconnected and decided to try going on a date. During a romantic Italian dinner on a snowy evening in January, everything felt right and they realized they must to be more than friends. They spent more and more time together, moved in, and got engaged two and a half years after that first date. Ever since he was born Webster spent each Summer at his grandparent's home in Prince Edward Island. It's a special place for his family and meant a lot when he took Amy to visit for the first time in August of 2015. She also fell in love with the Island's rolling hills and beautiful coastline. After a rainstorm, Amy & Web took a walk and sat on the cliff by Cape Tryon Lighthouse. Web used this as the perfect time and place to ask Amy to marry him, and she obviously said yes! One year later, they returned to PEI to get married. Feeling the pull of Prince Edward Island, they knew it was the perfect place to get married despite the distance from home. Every guest travelled from afar, making PEI a destination for all. 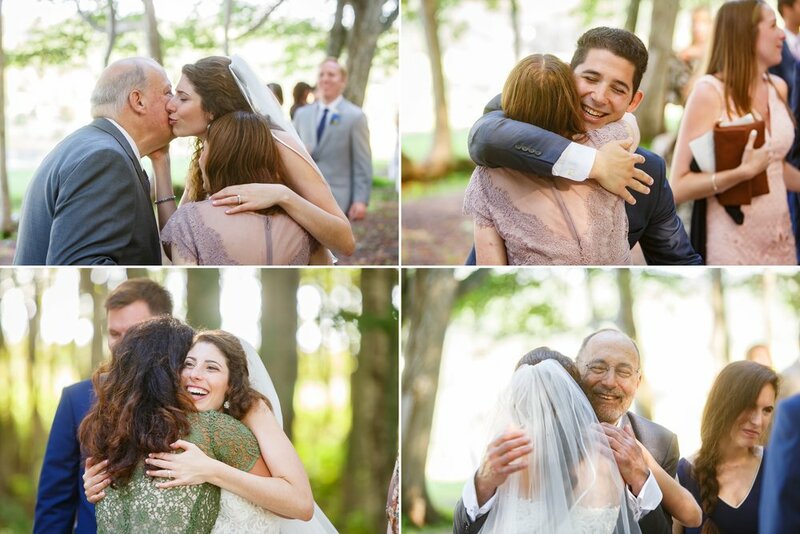 Using their families as their wedding inspiration, they also incorporated decor inspired by Amy's many visits to her grandparent's in Cape Cod. 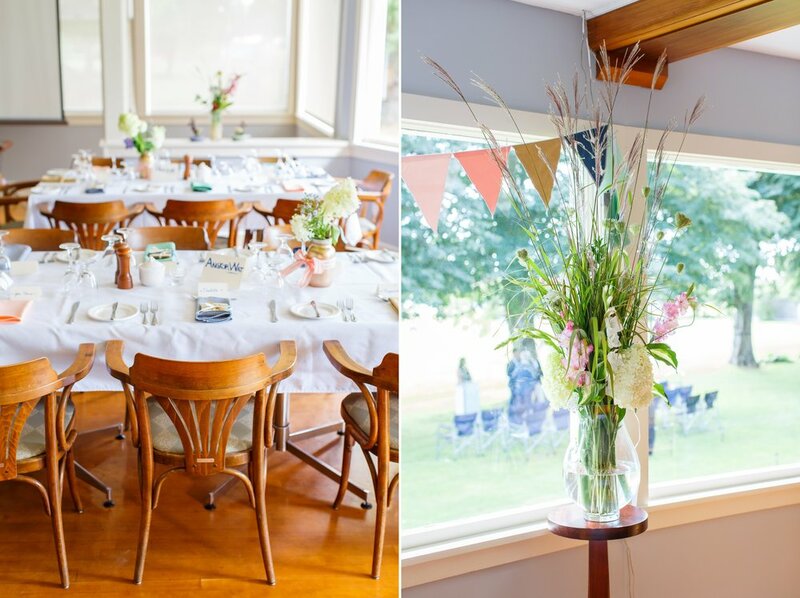 A nautical farm theme of navy and white was executed by Kiss The Bride. Despite the hard work that went into preparing, Amy & Webster's wedding day had a feeling of ease and simplicity that was focused on enjoying the Island and being present in the moment. 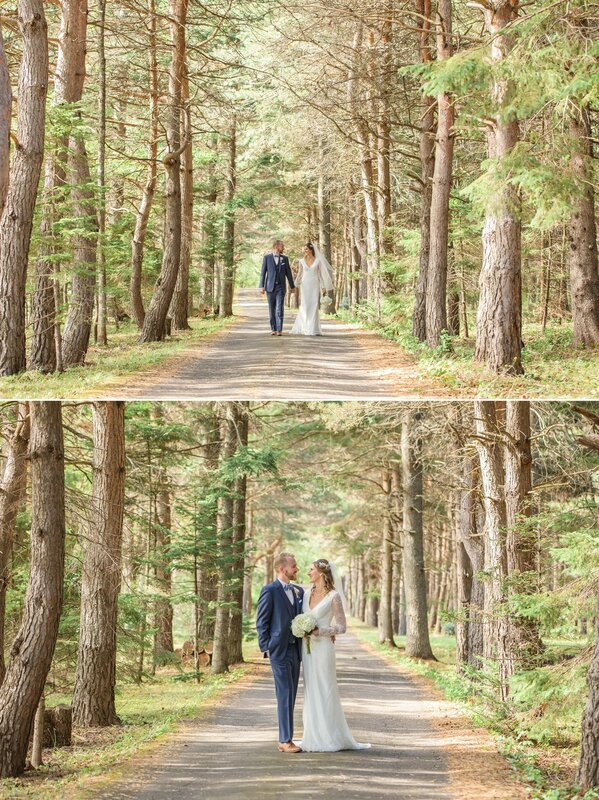 We photographed at Webster's parent's beautiful Summer property and the nearby French River beach, before heading to Clinton Hills for the ceremony & reception. 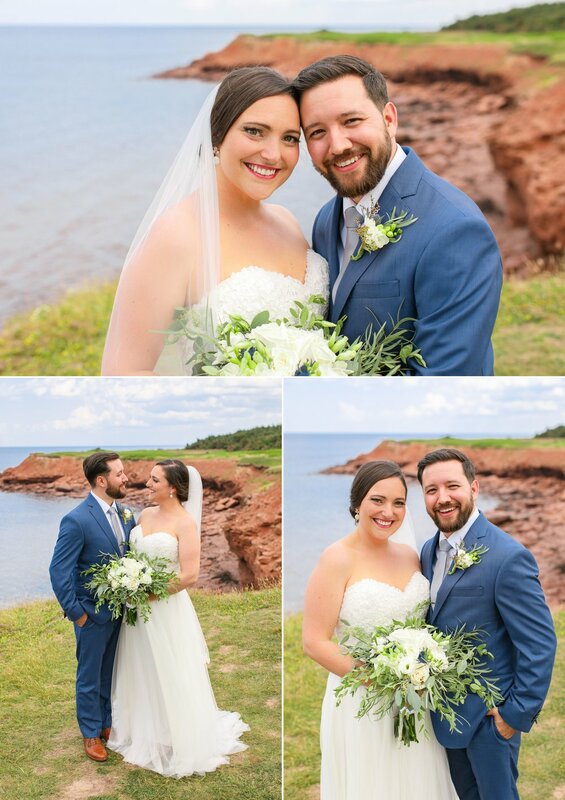 These two were a joy to work with, and I am so happy they feel in love with Prince Edward Island, and each other! Enjoy your day and trust those around you! Chances are you'll have support from your family, friends, and even staff from your venue, so plan ahead as much as you want but make sure you and your future spouse both live in the present on your wedding day to enjoy every moment. Jill & Gordie met through mutual friends at a music festival - Stan Fest in Canso, Nova Sctoia in 2009. The weather was awful that day, very rainy and muddy. A friend of Jill's went down to check on Jill and her friends in their tent and Gordie tagged along. When Gordie saw Jill for the first time he said she looked so sad he wanted to do anything to cheer her up. He brought her warm coffee and cold beers and gave her access to a real washroom, thus impressing her and beginning their adventurous relationship! Gordie travels the world as a musician (Gordie MacKeeman and his Rhythm Boys) and Jill joins when she can. Music has brought them across North America, Europe, India, and beyond. In 2016 they welcomed their sweet daughter Annie to the world and in 2017 they got engaged on the beach at her parent's home. 8 years and a child later, they set November 24th, 2017 as they evening they would get married! 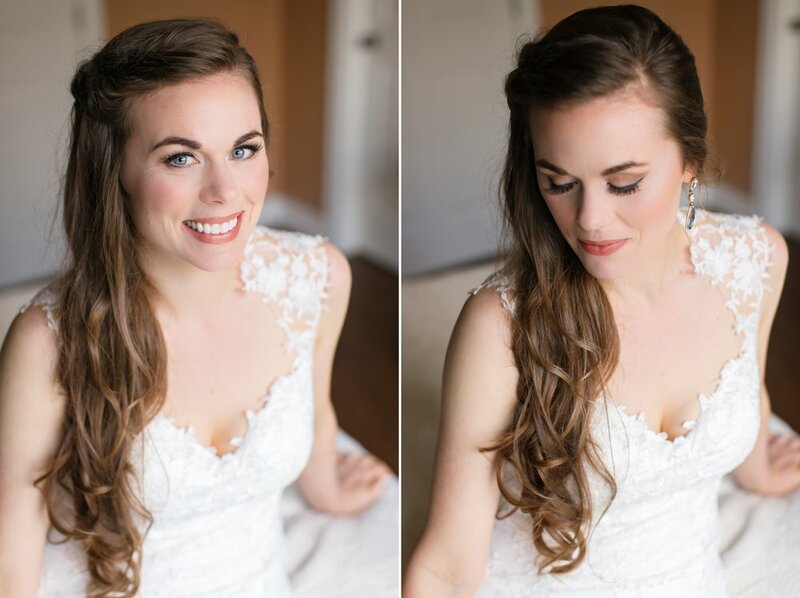 Their vintage wedding inspiration came from Jill's 1920 antique ring. With their homemade suit and dress, the Haviland Club setting, and the amazing hairstyles to match, this wedding looks like it could have been photographed many years ago. I love when a couple breaks from the norm and does their own thing, so this was a real treat to capture! Jill & Gordie's attitude was laid back and focused on spending time with their friends and family. We captured all of their photos in the evening, and then they danced the night away! "Don't sweat the small stuff. Try and let things slide as much as possible and pick your battles. In the long run a lot of things don't matter and there is no need to start a fight over something that really won't matter in a day, a week, or a year. On her first day of university at UPEI, Hilary arrived late to discover class was full and there was only one seat left in the room. She hurried in and sat down right beside Mike, not knowing that one day this stranger would become her husband! The weeks and months went by and Hilary & Mike became good friends through class, but later parted ways when they both switched schools. Almost two years later they ran into each other in Halifax and spent the rest of the night chatting and catching up. Little did they know, their conversation that evening would never end! Years later Hilary & Mike had travelled to see their favorite hockey teams play in Montreal. A few hours after arriving they hiked up to enjoy the views of the city from Mount Royal. Mike handed his phone to a stranger to take a photo of them and surprised Hilary by bringing out an engagement ring! Having photographed the wedding of Hilary's sister Bethany and Brother in law Brad, it was special to be invited back into their family again and see it combined with Mike's side as well. Mike & Hilary's wedding day was a hot blue sky day in mid July. They were married close to Hilary's home in Bedeque and celebrated at The Shipyard later that evening. They wanted their wedding day to feel romantic, dreamy, & modern and it did just that. We photographed the majority of formals at McCallum's Point, a special place to the Waugh family where Hilary spent a lot of time swimming and playing as a kid. Standing on the cliffs laughing and enjoying ourselves with the ocean all around us was the best kind of PEI Summer day! To everyone involved in this wedding day, thank you so much for keeping the good vibes going all day long! "Stay organized throughout the planning process. Understand that there will be a light at the end of the tunnel and you will eventually miss planning for your "best day ever". So enjoy it and don't stress!" Sydney & Phil connected on their first date in Toronto where Sydney accidentally arrived late, making Phil wait for her "dramatically" in the rain outside. Thankfully after meeting they were both completely at ease. During that date they broke the rules and talked about all topics you shouldn't discuss on a first date, but agreed on most points. After lots of healthy conversation and some debate, they quickly agreed to meet again soon, and ever since their second date two days later, they've been pretty much inseparable. Getting engaged was a joint decision they made, even shopping for the ring together. It was always clear that they would be together, so a wedding was just a formality - albeit a fun one! It was important for Phil to speak to Sydney's parents before proposing, so they planed a trip to see them in PEI. Phil asked the question under a big old tree in her parent's backyard, where they later took their first look photos on the wedding day. When Sydney & Phil talk about their wedding day, the thing they always come back to was what a positive, happy, and incredible day they had, surrounded by their loved ones. Most guests travelled from off Island to be there and everyone enjoyed the Island hospitality and beautiful scenery. The weather called for heavy rain and thunder showers that day but thankfully we dodged them throughout all the outdoor activities. Just as Sydney began to say her vows during the outdoor ceremony at Clinton Hills, a dramatic and loud clap of thunder hit, causing everyone to laugh and hope for the best! The rain held off just until we were all under the dry cover of the barn, when lighting and thunder began to roar outside. Sydney & Phil are two of the kindest and sweetest people you could ever meet, and working with them for this special day was so memorable. 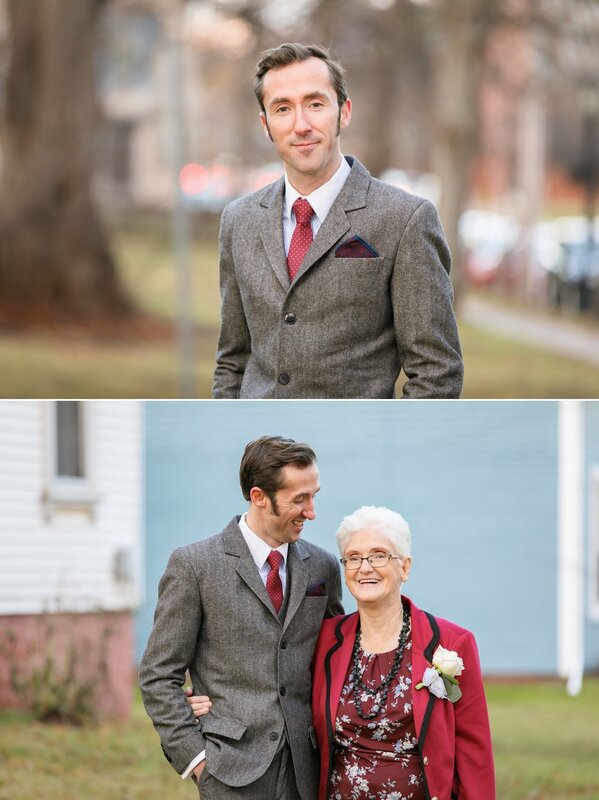 I absolutely love these photos and hope you will too! "Get a wedding planner. 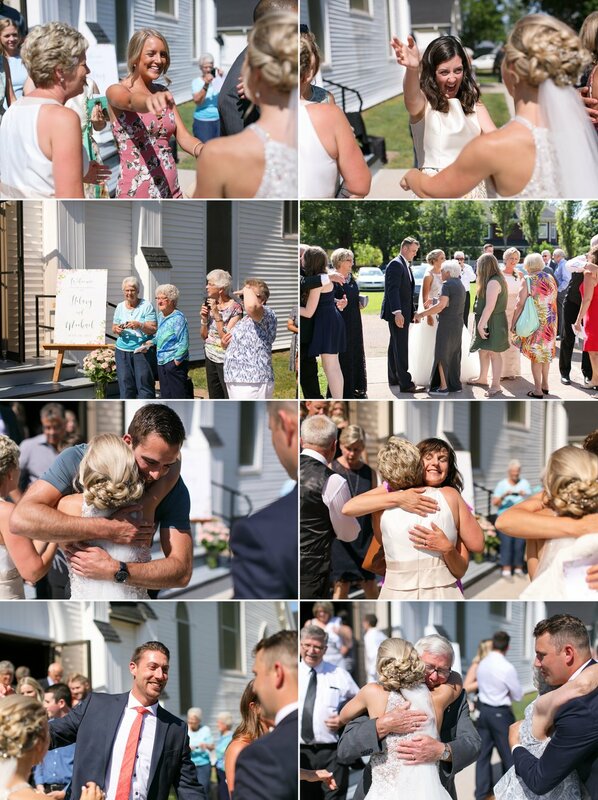 :) All the details were far more overwhelming than we anticipated, and although we were beyond lucky to have my friend Maggie coordinate everything, and lots of family members willing to help, we wish they all could have just enjoyed the day with us. Also, try to put as much meaning into the day as you can. All of the personal touches of things that people did for us (through things they made, or sentiments they shared) are the things we will carry with us forever." A mutual friend of Kate & Tyler's insisted for years that Kate just HAD to meet this Tyler guy, but Kate kept brushing it off. Eventually during an evening with friends at Marc's Studio they connected and Kate later realized the guy she was chatting with was Tyler, the one she had been hearing of all along. After a Facebook add and a some messages, they went on a date and the rest was history! Three years later with their dog Finny in one arm, Tyler proposed in front of the lighthouse at Covehead Beach in June, 2016. Afterwards they went back to Kate's parent's house and celebrated with all her immediate family! Excitement was in the air during Kate & Tyler's wedding day. The mood was fun, light hearted, and definitely energetic! My favorite thing about Kate & Tyler is Kate's ever present excitement and enthusiasm mixed with Tyler's calm and cool demeanor. They make such a great pair that are so fun to be around and you always feel at ease. Capturing their personalities, relationship and dynamic was a blast and as Kate put it, "the best day ever!!" Thank you so much to everyone who pulled this day together, and Kate & Tyler for choosing me to capture it! "There are so many options out there and it is easy to get swayed into "what is popular" but I think what we loved most about our wedding is that we truly did what made us happy and we both tried to put the focus on each other, and not the small details. Also, try to remember every moment! It goes by in a flash!" wedding dress - hayley paige "sunny gown"
Jossie & Liam are big animal lovers and came up with special touches to include them into their wedding day. 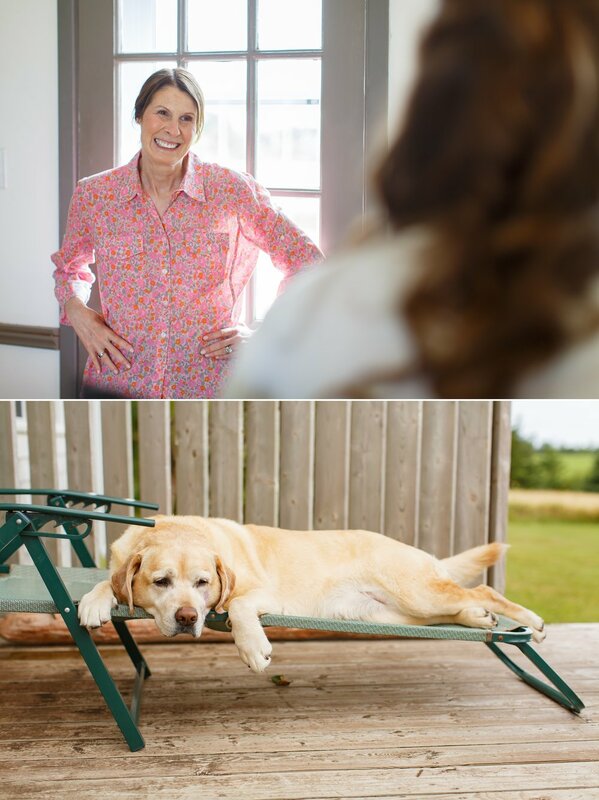 Jossie is a long time staff member of The PEI Humane Society, and the couple has fostered countless animals in their home over the years. When Liam proposed to Jossie, he brought her along as he pretended to be looking for a family friend's lost dog in Victoria Park, but when they found Divot he had an engagement ring on his collar! On their wedding day the same dog was their ring bearer and carried rings on his collar once again. 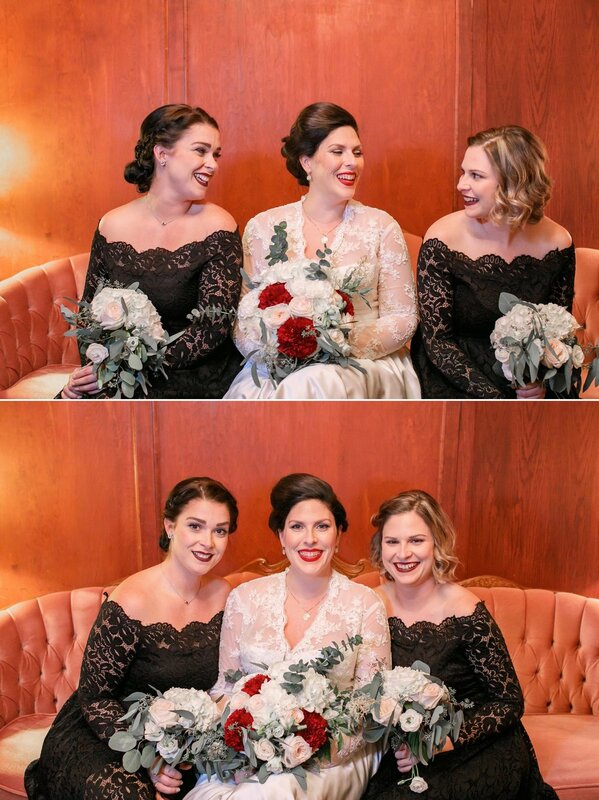 Adorable foster kittens from the PEI Humane Society helped the girls get ready the morning of the wedding, and these cute photos went viral - being featured on The Dodo, Yahoo, Yahoo News, and CBC! All kittens were quickly adopted afterwards. Brittany & Allan met long ago as young teens when they both worked at the Cavendish Boardwalk in the Summer months. Allan was Brittany's best friend's manager which led to them often running into each other before Allan finally built up the courage to talk to Brittany. After a few dates Brittany claimed she didn't want a boyfriend, but once Allan got another girlfriend, Brittany soon changed her mind....haha! Many flip phone text messages were exchanged and their dating years began. After 7 years together Allan proposed to Brittany (who is a teacher) while having coffee on their patio the morning of her last day of school for the year. They flew home to PEI that evening and celebrated with everyone they loved. I met Brittany and Allan during our university days at UPEI when Brittany and I lived in the same residence building. We later bonded more over our shared experience as exchange students in sunny Barbados. When it came time to plan their wedding, I was thrilled to be their photographer! As evident in the emotions, expressions, and the laughs in these photos, Allan & Brittany fully enjoyed their beautiful day this past July. An all star team of vendors helped pull it all together as well. Congratulations Britt & Allan, you are the funnest! Enjoy every moment and don’t get overwhelmed with all the small details. It is truly about the memories you get to make and the moments you spend with all the special people in your life. The immense love you get to feel that day is unlike anything, so soak it all in! Since photographing the wedding of Katie & Greg on NYE 2015, I love the idea of a December 31st wedding. What better way to celebrate and dress up then attending the wedding of two people you love? Or as Gloria put it, what better way to start a new year than to marry your best friend! Gloria & Nick met in 2008 while both attending UPEI and started dating 3 years later. Shortly after this Nick moved off Island for work as an engineer, but began driving back to PEI every single weekend to visit Gloria. On a cold and rainy day in the Summer of 2015 during their annual hike around Howe Point, Nick used the help of their golden doodle Ollie to propose to Gloria. From there started the wedding planning for NYE! 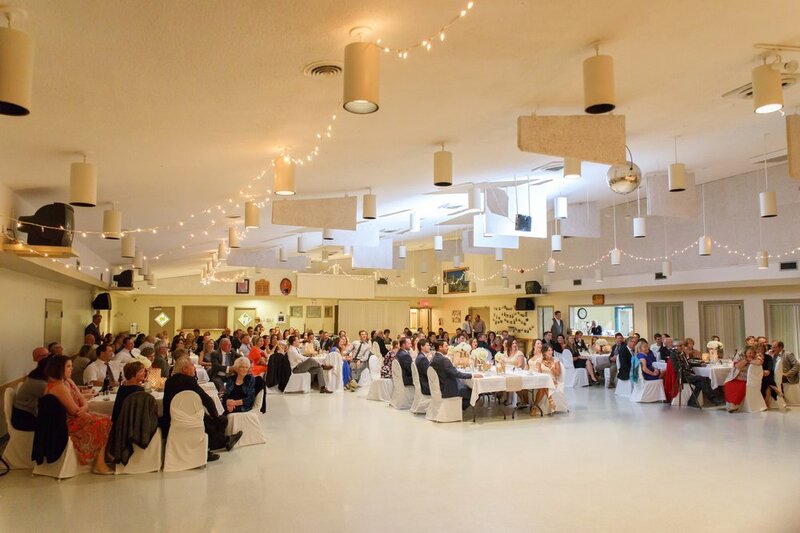 It is safe to say everyone had such a fun time at this wedding. Gloria & Nick are the type of people you want to be around, and feeding off their energy and enthusiasm was so great. They took every moment as it came, didn't stress about small details, and took the time to enjoy a few limo sociables. It was like hanging out with friends and I love that I was able to capture this day for them. Thank you for the laughs, the hugs, and the espresso shots. To Gloria & Nick, here's to many more happy days like this! 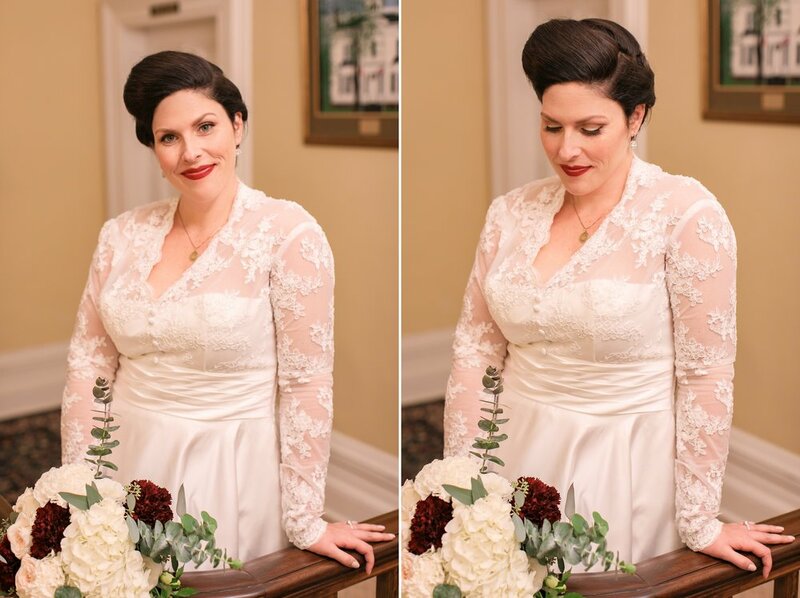 At the end of 2015 I received an email from Halifax wedding planners Elegant Productions about a mystery couple who just had to have me for their 2017 wedding day in Kentville, NS. I was flattered but curious as to who it was and why they were hiring an Island based photographer. After several emails to confirm things I was surprised and thrilled when my friend Brittany sent me a message letting me know it was her and her fiancé Clark that I had booked! It was a beautiful thing to be invited to capture their wedding day this Summer at Healy Farm in Kentville. Surrounded by family and friends, including many who travelled all the way from Clark's home of Australia - Britt and Clark made everyone feel special and appreciated. They are two of the kindest people and I am so happy to call them friends! A backpacking adventure turned into an unforgettable love story for this fun loving couple when they met during Brittany's travels abroad. Movie nights and walks home from the pub lead them to their fist official date. Upon Brittany's return, the two continued their 2 year long distance relationship. Toughing it out, Brittany and Clark re-united and went on a bucket-list tour of Newfoundland. It was on a beach in Fogo Island that Clark romantically picked a pebble, and proposed. If that isn't cute enough, the two decided to get married on the 5 year anniversary of telling one another they were in love. 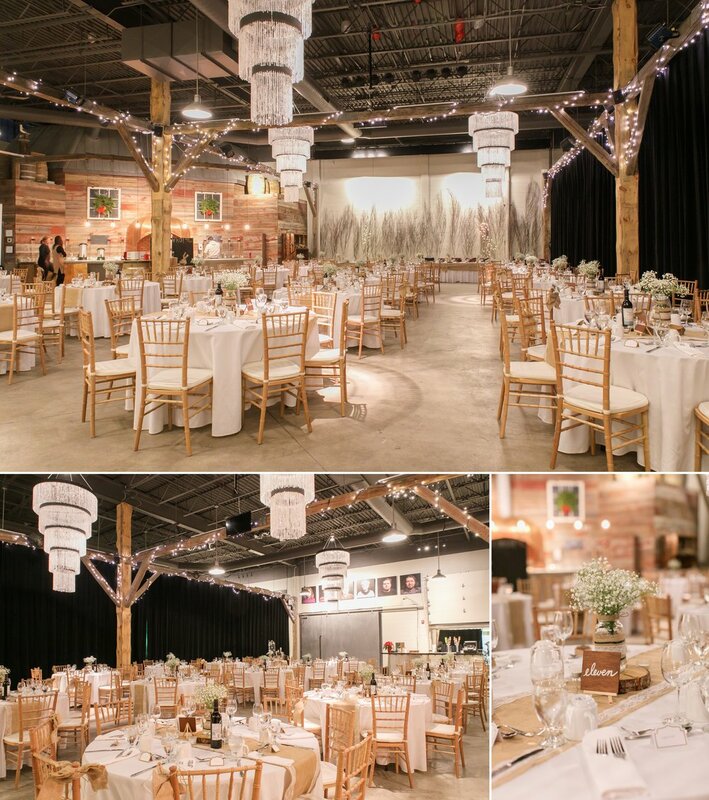 Elegant Productions helped bring Brittany's vision to life with a beautifully treed venue (Healy Farms) and added touches of vibrant Canadian greenery with hints of yellow mustard. 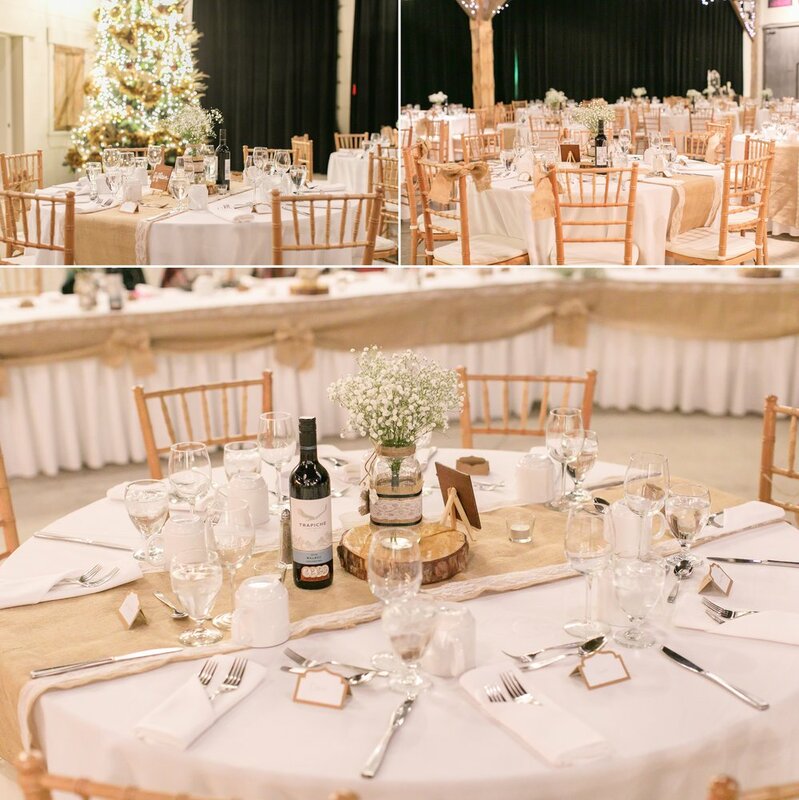 Soft tones were paired perfectly with the raw harvest tables and refurbished wood chairs Brittany's late grandfather had crafted over the years. The day was a perfect fit to reflect the spirit and love Brittany and Clark share with one another. It was an honor to capture this day for my friend her new husband. 1. In their own word's, Brittany and Clark recomends couples take their time with the planning process. Enjoy every minute of the engagement! 2. Invest in a Pro! Help take the heat off by hiring a planner to help turn your vision into reality. 3. Consider stocking non-alcoholic beer and wine for 'cheeky' guests who may secretly be pregnant. Hannah is a Jasper girl & Michael is a PEI boy who met while Hannah attended UPEI. After dating for years he proposed on the Island in front of 20 family members, followed by a surprise party with all of their closest friends, with lobster, fireworks, and cake to boot! When I received the initial email from Hannah & Michael asking if I would consider traveling all the way to Jasper to capture their Spring wedding day, I was completely on board right away! It had been 12 years since I'd seen Jasper and the thought of photographing a wedding there was a dream. I knew Hannah and I had mutual friends and although we had never officially met, I knew she was just as great as everyone always said. Once we met we clicked right away and it was like we had always known each other. From the moment I arrived in Jasper, Michael, Hannah, and their families made me feel apart of their group, inviting me to a family BBQ, rehearsal party, and other activities. Everyone was so incredibly friendly, welcoming, and fun! I took some time to hang out, ski, and hike before the wedding as well. If you're also thinking of a destination wedding, let me know! Hannah's Dad Warren said that "every good day starts with exercise", so on the morning of the wedding a group of us set off for a 6am hike to Old Fort Point, overlooking Jasper. It was a beautiful morning with a dusting of fresh snow that would later melt that afternoon. We all enjoyed the peace and quiet at the top of the mountain and appreciated being together. After an outdoor ceremony by the river that afternoon (complete with a hail filled canoe arrival! ), everyone enjoyed a casual 'outdoor picnic' with a bonfire, marshmallows, homemade beer, snacks, and a rule of only comfy clothes allowed. We travelled around town photographing and followed it up with a party that lasted late into the night. The next morning we had brunch and sadly parted ways, reflecting on an amazing and dreamy experience. I loved their advice to other couples - do not be afraid to be different because they were so happy with all of their choices! They centered their wedding around everyone having fun, and didn't worry about the tiny details. Thank you Hannah & Michael for being incredible hosts, clients, and now, friends. Cheers to the #Wamsays! Karen & Lloyd met and started dating in their home province of Newfoundland 11 years ago. After five years together they decided to pack up and move to Prince Edward Island, to a property they never even saw in person. They now call the Island home, living in between two potato patches just as you would. Inspired by their ongoing happiness and love, they decided to elope this June with a little 5 minute ceremony on the North shore of PEI. With just the two of them, Marsha Weeks, a friend to sign as a witness, and me to sign as the second witness, they had a simple and special ceremony overlooking the water. Being a long time Anne of Green Gables fan, Karen picked the picturesque Avonlea Village for photos of the two of them afterwards. We then spent an hour and a half together, laughing and enjoying their new titles as husband and wife. Whether your wedding has so many guests that I can't possibly make my way through them all, or so little that I must sign as a witness, everyone's love is just as special in the end. They said they didn't have one good photo of the two of them, but now there are so many. Thank you to Karen & Lloyd for sharing your happiness with me! Shauna & Jared's relationship began as high school sweethearts, having their first date over pizza and a movie. Their young love eventually struggled with the distance of studying at different universities and they went their separate ways for a couple years. After realizing how important they were to each other, they rekindled in 2008 and have been together since! With the ring hidden in his mitten, Jared proposed in January 2015 while snowshoeing on Shauna's Dad's property in Wellington. He kept lagging behind to get in position and when she turned around, he was down on one knee! I met Shauna & Jared at Jared's sister's wedding (Erin & Nick - Patio wedding at The Shipyard) where they were both two energetic and fun members of the wedding party. Getting the request to photograph their wedding next was exciting and when the day came it didn't disappoint! This crowd is so much fun to be around and you can see how many laughs they all have together. Shauna & Jared were gracious and welcoming as always, making their wedding a beautiful day to share in! I love so many of these photos and I hope you do too! Congratulations Mr & Mrs Wright! So excited to share this wedding day! During the time they were living in Toronto, Liz & Josh contacted me about their Halifax, Nova Scotia wedding at the Saraguay House and I was very interested from the beginning. I photograph the majority of my weddings on Prince Edward Island, but if the timing is right I love to travel too! 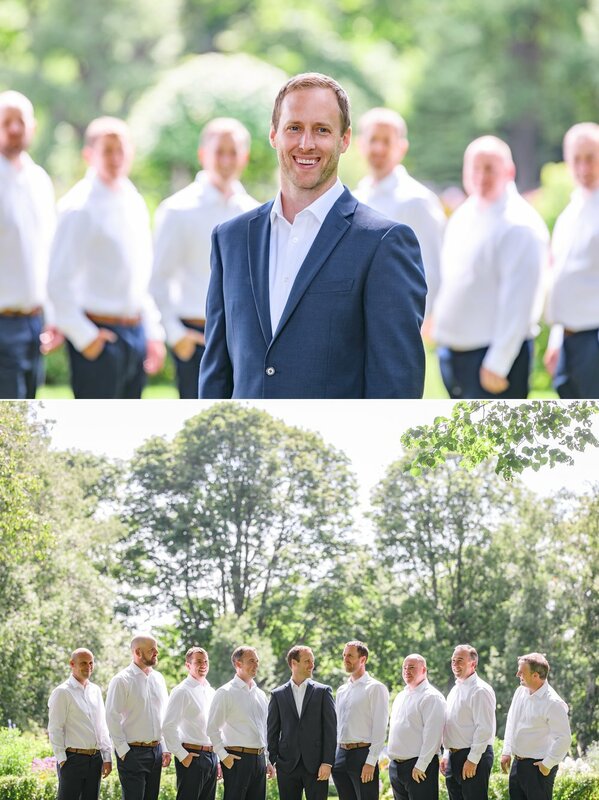 It was easy to see why Liz & Josh chose the The Saraguay House, it was an amazing backdrop for their east coast wedding and Elegant Productions showcased it all beautifully. Liz & Josh are a super interesting and fun couple who met at the concert of their mutual friend (who later played during the cocktail hour!). They quickly hit it off, became engaged, and planned their NS wedding, where Josh used to live. Their attitude towards the wedding day was so calm and easy, and they truly enjoyed their time with friends and family. I believe the vibe and the fun that was had shows through in these photos and that is just what you want from your wedding photography. This wedding was also incredible for me as a wedding photographer, so I hope the fun I had also shows through! Katelyn & Patrick originally met at Montague High and quickly became friends. They attended classes together, were each other's date to Christmas Dance, held hands at the movies, and danced to James Blunt through their awkward teenage years. After high school they kept in touch as they went their separate ways, and later crossed paths again one Summer night, dancing the night away. They kept running into one another again and again that Summer so they decided to give things a go. Over the years they lived in different provinces, travelled, graduated university, bought a home as well as a dog and a cat. Wedding talk was never a matter of if, but only a matter of when. They were engaged in December 2015 while walking their pup William on the snowy beach by their future home. This home later became the setting for their wedding ceremony on a gorgeous blue sky day this past September overlooking the Brudenell river. I'm lucky to say Kate & Patrick are friends of mine and they are the type of people everyone loves to have around. They have many friends and there were a lot of fun personalities in attendance which made for a great day, and a great night. It was an honor to document their wedding day! Congratulations to The Drakes! hair piece - oh dina! Josie & Nick have already been together a whole 12 years, since they were little high school kids in grade 10 and 11! After high school they both completed their university degrees and began 4 years of long distance, which ultimately made their relationship stronger. Being a doctor and a nurse, their careers have taken them from Charlottetown, to Halifax and now to their new home in Kelowna, BC. However, when it came to planning their wedding they returned to PEI for the big day. 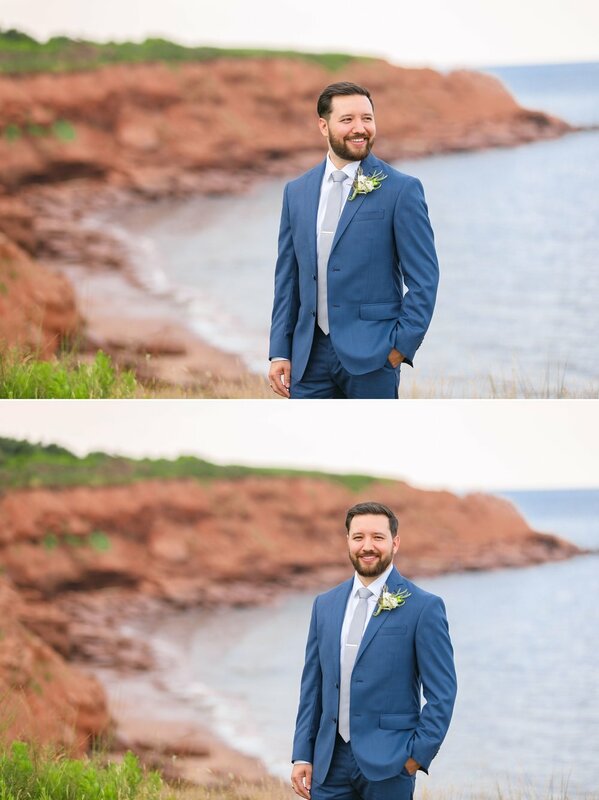 We started their photos at Josie's parent's home and then headed to the Prince Edward Island Brewery for their wedding ceremony and reception. I often get asked if I enjoy photographing my friends, and the answer is always YES! There were so many members of the wedding party, family, and guests that I knew and it made the experience even better. Starting with one of the most real and emotional first looks I've ever captured, Josie & Nick's entire event was a joy to be a part of. Their love is so strong and evident to everyone around them, it really was a beautiful thing to see. Plus, don't they look so great together?! In the winter of 2013, Lindsey & Derek connected in Canmore, Alberta and went skiing for their first date. What was supposed to be a couple hour long date turned into the entire day as they laughed and chatted the whole time, feeling as though they had met each other ages ago. Since then they have been back and forth between Derek's home on PEI, and Lindsey's home in Alberta. 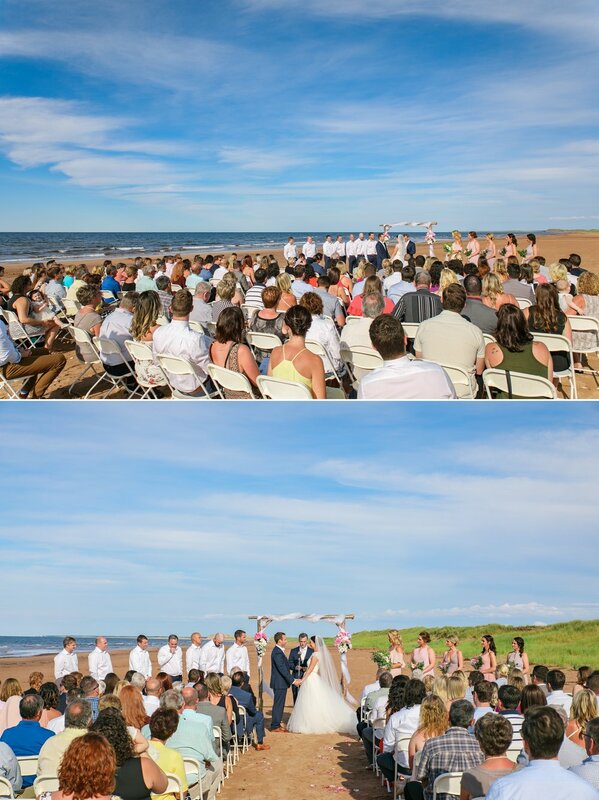 When it was time to plan the wedding day, their cottage in Rollo Bay, PEI became the perfect setting. It was a rainy ceremony but with their positive and fun attitudes, it was hardly noticed. Lindsey & Derek are incredibly laid back and easy to be around. Their wedding day reflected this from the start and the main priority was for guests to be as relaxed as possible. As Lindsey put it - "We broke every rule we could...no assigned seating, ditched the cake and formalities, sat on hay bails and just had a ton of laughs and love." One of their favorite moments of the day was when Derek surprising Lindsey with professional highland dancers and bagpipers at the reception! Lindsey used to teach highland dance and it has been a tradition in the family to dance at each other's weddings. They had the entire barn moving so Lindsey and her sister even joined in on the fun. I hope you will enjoy all the laughs and moments from this day as much as I did. Thank you another amazing couple, and congratulations to The Hennesseys! 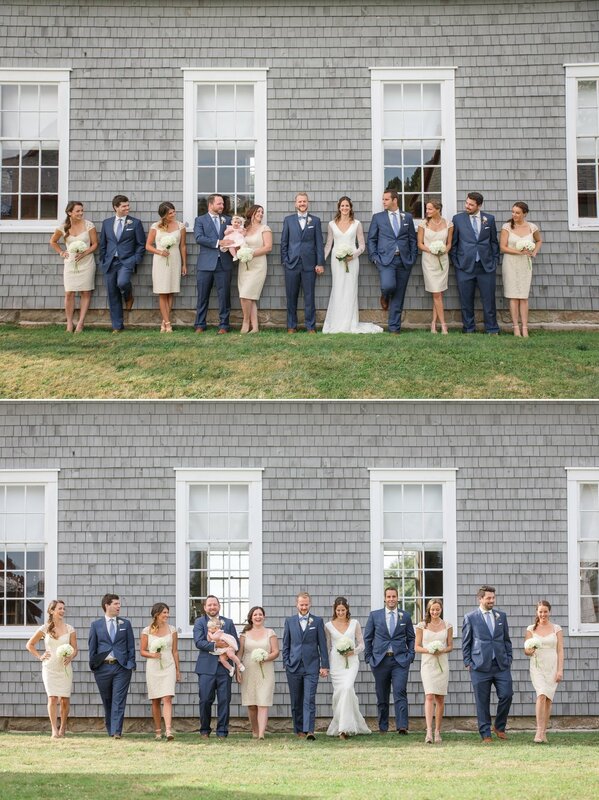 Laurence & Peter wanted the focus of their wedding day to be about celebrating with friends and family in a relaxed and casual atmosphere on beautiful Prince Edward Island. Although Laurence is from Montreal and Peter from Halifax, many of Peter's family is from the Island and it is where they spend a lot of their vacation time during the year. When it came time to plan their wedding, PEI seemed like the natural fit! Many guests travelled from away so the Island became the home base for a week of activities to thank everyone for coming from afar. The picturesque Shaw's Hotel provided the wedding venue on a sunny and warm September afternoon. After the backyard ceremony, we escaped to the beach for photos while guests enjoyed lots of time to mingle, drink, and eat some Island seafood chowder. We all gathered again on the back patio for some stories and laughs before heading inside for their incredible meal and more speeches. Laurence & Peter's friends even surprised them after dinner with a hilarious puppet show depicting how they met and fell in love! Then, it was on to the 'Lobster Trap' barn to dance the night away. 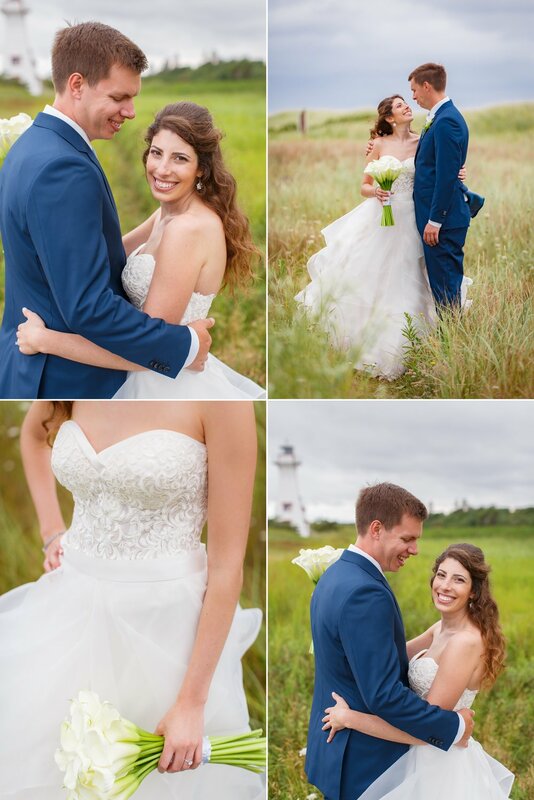 Thank you Laurence & Peter for choosing Prince Edward Island for your beautiful wedding day! Venessa & Fabian met 6 years ago through mutual friends at a NYE party in Halifax, Nova Scotia. After only dating for a short time, they spontaneously booked a trip to the Caribbean which turns out would be the start of many more travel adventures together. The pair were engaged a few years later when Fabian popped the question right before their big European vacation. They spent those next three weeks basking in their engagement bliss! 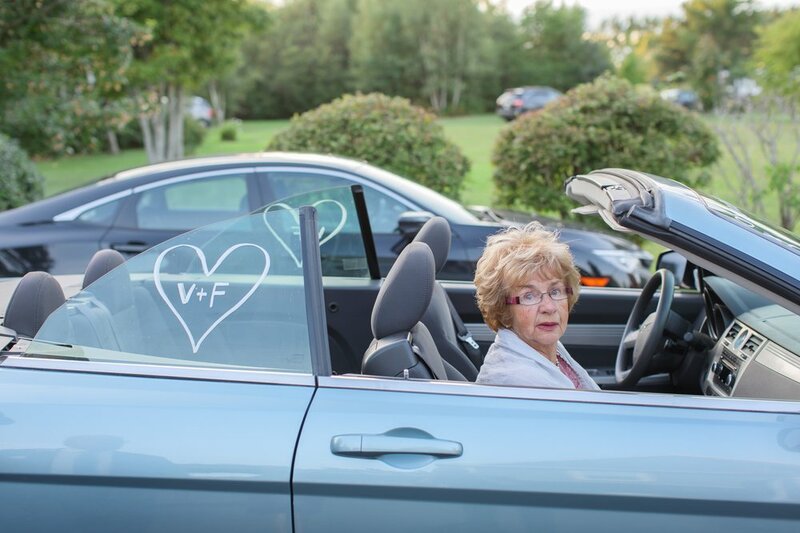 Their September wedding day was a relaxed and casual affair with the ceremony taking place in Venessa's parent's backyard in the community of Grande-Digue, outside Shediac, New Brunswick. The blue sky, warm breeze, and water views made for an incredible set up. 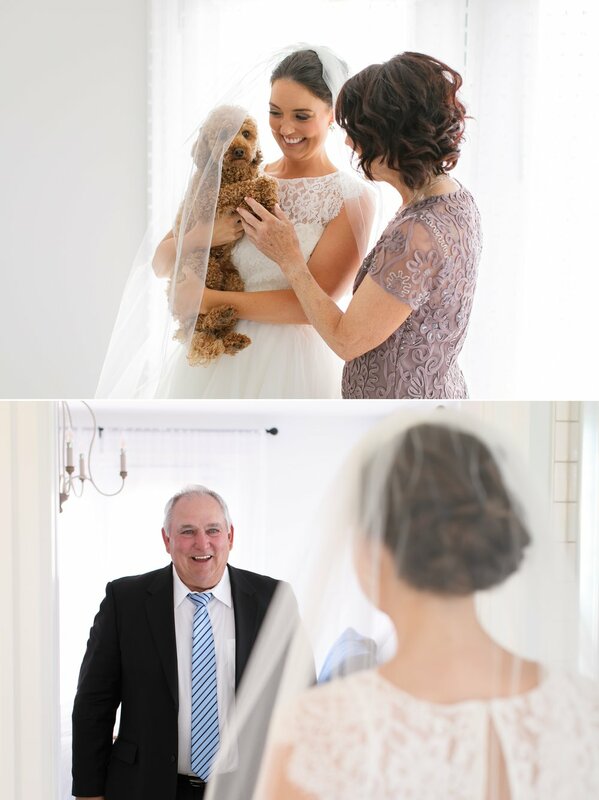 Two friendly and welcoming families came together that day, making for a wonderful time. Fabian and I are first cousins, so their day was even more special for me! Ven & Fabian are just the type of people you want to be around. Their caring and genuine personalities made every guest proud to be a part of their wedding day, one we will always remember. 11 years ago back in 2005, Megan borrowed a friend's spare school ID to sneak into Colonel Gray's high school dance. It was here that she first met Mitch. After sharing a few dances, they kept in touch and have been together ever since! Real life high school sweethearts. Wedding planning began 10 years later in 2015 when they got engaged during a Summer trip to Cape Breton. Mitch later surprised Megan by engraving her wedding ring with "it all started with a dance". Megan & Mitch wanted their wedding day to be about how everything felt, not how everything looked. This is certainly evident by their expressions, laughter, and happy tears all throughout the day. 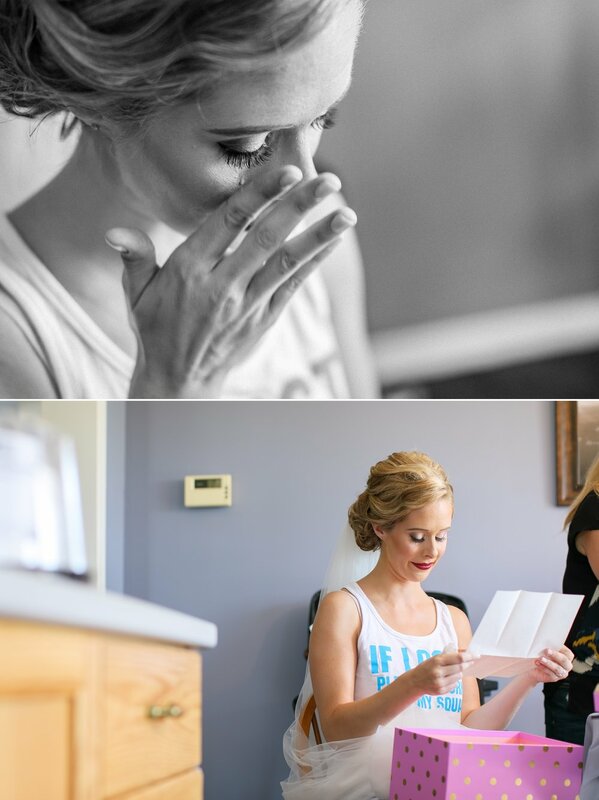 The amount of emotion was so special to see, and really brought their wedding photos to life. They have the biggest hearts and are loved by so many. Their advice to other couples getting married is to keep things focused on the marriage and not the wedding, as guests are there to celebrate you and your marriage and the rest of the material things will fall into place after that. Very true words.